Love is vital for human development. Studies have shown that babies thrive when they are loved. They will fail to thrive if they are not. We are born knowing how to love but often lose those skills as we grow older. The only true way to re-learn how to love is to simply love and allow yourself to be loved. While one can read all about it, it can’t be learned from a book, magazine article or blog post (believe me, I have tried) but instead it must be experienced in the flesh. Love is a choice. Despite what I read in fairy tales and young adult novels, there isn’t some bolt of lighting that strikes you. There isn’t just one soul mate “out there” for everyone. Instead love is a conscious choice that we each make each and every day, a choice to open our imperfect hearts to falling in love with other imperfect soul before us. Everyone wants to be loved. Every single one of us, whether we admit it or not, move through the world seeking love and connection through our words and actions. The problems arise when we figure out that what we want most in the world is often what we fear in equal measure – being seen and loved matters that much. I know that I have been guilty of pushing away love for fear of it being taken away. Then, out of the blue, I am reminded that I am seen and held and loved by friends I have chosen in my life. They continue to show me that they choose to love me. I will meet a friend for brunch or receive a lovely text, a funny email or have a Facebook conversation and I am emboldened to love big and awkwardly and openly again and again and again. I am still re-learning. I am always trying to remember that though not perfect, when my intention is good and pure and there is no way to ever love wrong. thank you for your kind words. i will remember and i will totally take you up on that hug the next time i see you! tears on this end as well! thank you for being in my life! Thanks Patty! Your comments always remind me that what I have to say is important and that it is good to keep showing up as I am. I love you! I love the quote you picked to begin your post. I used to feel like that little girl. Things have shifted for me over the last year and this is a great reminder for me of where I want to be. I feel myself opening up more and more and it is a conscious effort. I do forget and go back towards putting up walls however I find it is not as often. Thank you for your words! Thank you for sharing your story! You are love. the feeling is oh so mutual. you are a gift to me! Valerie, this is beautiful! Love it…. thank you so much for your kind words. they mean the world! I totally agree with you that love is a conscious choice. A few years ago, and after (another) painful breakup, I felt the need to distance myself from others…mainly men…for fear that I would fall back into old (and unhealthy) relationship patterns. So I spent a year or so just learning to love myself again. But I remember vividly, a time when I journaled about being ready to get back into the game, to love again…and be loved (the hard part). I remember making a conscious choice to welcome love back into my life. It was shortly after that day that I met my (later to be) fiance. I often wonder if we would be together today had I not been ready & open at that time. Kate, thank you for sharing your story. It comes at just the right time… you have no idea! I am so happy that you did open your heart and found you fiance. This is so beautiful and raw and honest – thank you. Even after being married for 7 years, I still feel awkward with the way I love at times. Definitely so with friends. 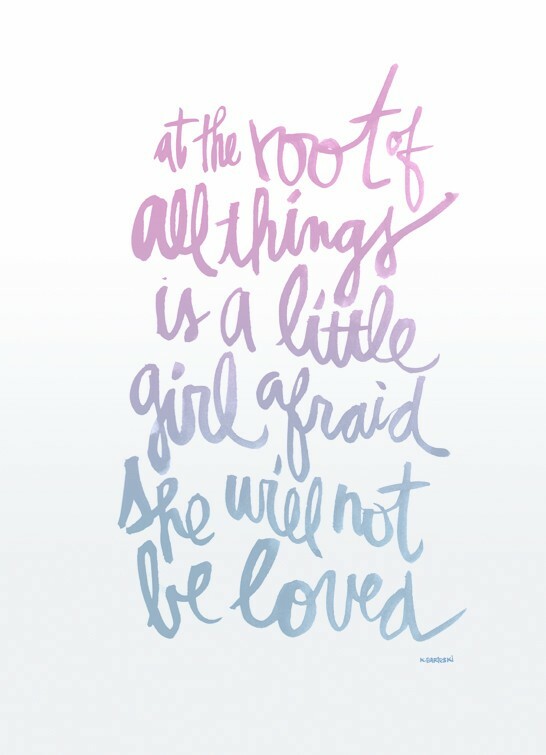 As I expand into greater love, I often feel I am too much and I too am that little girl – it strikes me at the strangest moments. One of my favorite Rumi quotes is the following: With life as short as a half-taken breath, don’t plant anything but love. What a beautiful post about love. It opened my heart right up. Love keeps this world swirling with so much beauty. It may not always be easy, but I always find it worth it. Even if it ends in a way we did not expect ~ the moments ~ the blissful moments ~ they always seem to be worth it for me. My life is a series of moments that are building on one another. Creating this beautiful structure of memories, that fill my heart and bring a smile to my face. Keep putting yourself out there and loving. Because it will open up a whole new world to you, that you may have not realized was just waiting to meet you. Oh, my dear. I so get this. I have been working on opening my heart, allowing myself to be vulnerable, and it is the hardest thing in the world for me and I mostly don’t know what or how to do it. It is somehow hopeful to know that I am not alone. Thank you.